Early last week I highlighted the extended valuation of the utility sector in part due to investor demand for income yielding stocks. Not only are the income sectors attracting investor dollars, defensive sectors like consumer staples are as well. A result of this investor demand for defensive and income producing equities is these sectors have produced market beating returns so far in 2016. As the below sector return chart shows, the defensive consumer staples sector and the income yielding sectors like utilities and telecommunications have generated strong returns this year. However, the strong return in these sectors has pushed the sector valuation beyond the average longer term valuation for each respective sector itself. 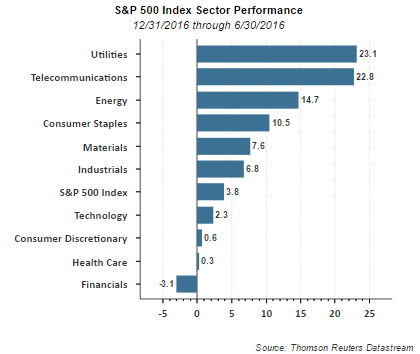 The better performing sectors, utilities and staples are some of the most extended compared to the other sectors. 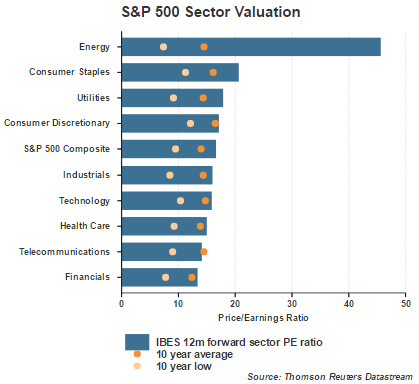 Energy sector valuations are at extremes, largely due to earnings headwinds resulting from lower oil prices. 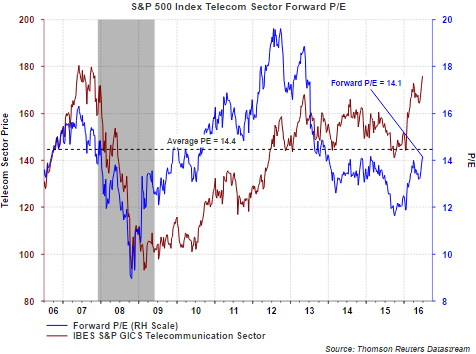 Of note is the fact the telecommunications sector is the second best performing sector this year, yet, its current valuation or P/E remains below its 10-year average. 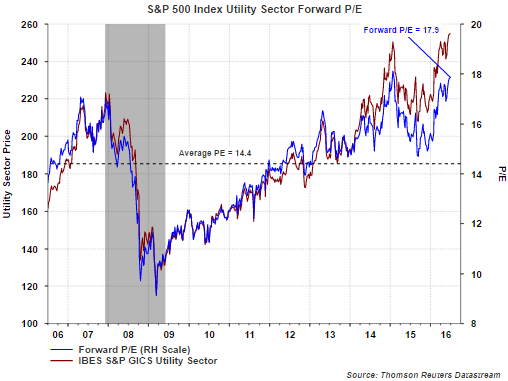 For utilities, the forward 12-month expected sector earnings growth rate is only 3.4%. In Q1 2016, although earnings were positive for the utility sector, earnings fell 4.3% as compared to the same quarter last year. Consequently, with utilities trading at a forward P/E of 17.9 times and expected earnings growth of 3.4%, this leaves little margin for error. 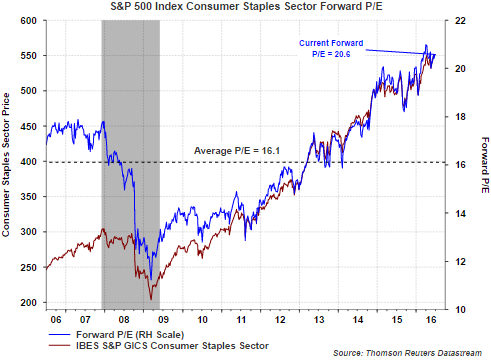 The consumer staples sector valuation is as stretch as the utility sector as can be seen in the below chart. In Q1 2016 staples did generate a small positive in earnings growth, i.e., up 1.5% versus Q1 2015. The 12-month forward earnings growth rate for the staples sector is 7.9%. Investors will note, higher stock valuations can be supported at a lower level of interest rates like the environment we are in today. However, when the market begins to price in a move to higher interest rates, higher yielding stocks will act like bonds and be subject to a downward price move. Specifically, the income yielding sectors trading at extended valuations could be particularly hard hit.